Abby Kelley Foster, an abolitionist in the 1850’s from Massachusetts, travelled the midwest stirring a passion for social justice and political reform in a time of racial oppression. 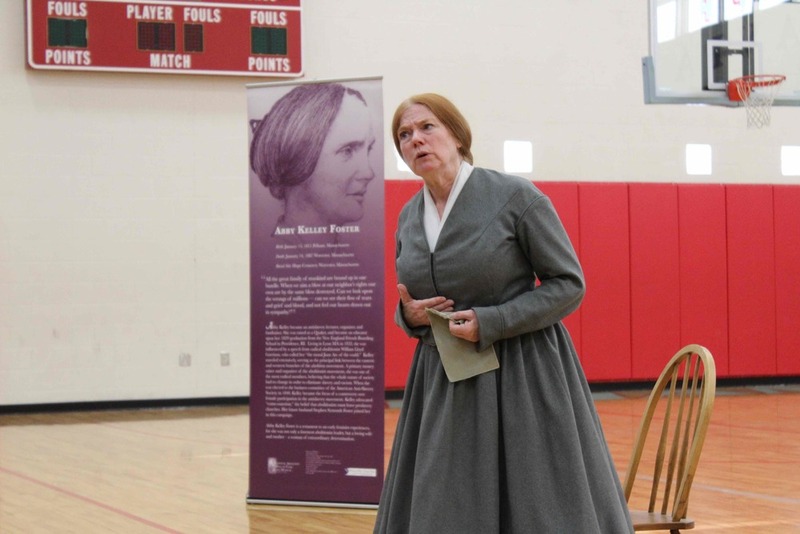 In her dress and character, Lynne McKenney Lydick, actress from Worcester, Massachusetts, visited Alliance much like Foster did over 160 years ago to spread her message. Sponsored by the Friends of the Rodman Public Library and Arts in Stark, Lydick performed her monologue of excerpts from Foster’s lift at the Rodman Public Library and at Alliance Middle School last week. In the 1850’s Abby stayed at the Haines House and spent much time in Ohio between Alliance, Salem and the surrounding areas spreading her message through establishing anti-slavery newspapers and holding public meetings. “Abby was ahead of her time. There’s a book at the library about Abby and after reading it several of us (at the Alliance Preservation Society) said ‘it’s time to bring Abby back to Alliance,’” Kay Brown of the Alliance Preservation Society said. “Ahead of her time; Abby Kelly and the politics of anti slavery” by Dorothy Sterling is at the Rodman Public Library . It was one of the books used to write the script for Lydick’s performance of Foster’s life. Since Foster didn’t keep diaries of her daily life, facts about her are pieced together from newspaper stories covering her speeches and from letters she wrote to her husband Stephen Foster and people who hosted her on her circuits. Foster spent nearly three years in Ohio, much of that time spent helping to launch the anti-slavery newspaper in New Lisbon, Ohio, which was renamed Lisbon before the newspaper was written out of Salem, Ohio. Sojourner Truth and Frederick Douglas, along with other speakers and abolitionists travelled with her to speak. Students at Alliance Middle School watched the performance and were able to ask questions afterwards.One question asked to Lydick was what her favorite part about Foster is, and why she was interested in performing her life. “My favorite thing about her was her courage. She was doing this at a time when women were not supposed to have civic thoughts of their own...Her courage to stand up is movement politics- it’s people speaking to people and encouraging them to do what it right,” Lydick said, drawing similarities to movement politics of today. 160 years ago Foster’s message that all people should be equal was not accepted at the time. Some of her worst critics were clergy, Lydick explained. Foster’s husband, Stephen Foster, wrote a book called “The Brotherhood of Thieves” about the way pastors and clergy treated social justice movements of the time. In 2011 Abby Kelley Foster was inducted into the National Abolitionist and National Women Hall of Fame. “Each of us must do something to aid the cause of humanity injustice,” Lydick as Foster said at the end of her performance. Students in the 8th grade choir opened the performance at the middle school by singing “I am an Abolitionist,” led by choir teacher Sue Michaels. Lydick travels all over the country performing at schools as Abby Kelley Foster.